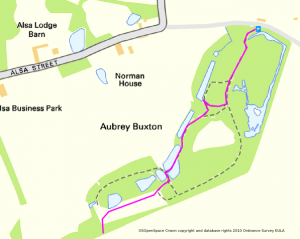 A walk of about four miles to see the countryside around Stansted, with a visit to the Essex Wildlife Trust Aubrey Buxton Nature Reserve. OS Explorer Sheet 195. Starting from the car park by the castle and railway in the centre of the village. OS Reference TL517249. 1. START at Stansted Mountfitchet Car Park, beside the Castle and the railway. Walk out of the car park at the junction with Lower Street and turn right to go past the interesting shops in the centre of the village. Cross the road and continue on the left hand pavement along Lower Street (NB do not go up Grove Hill) until opposite the Dog and Duck public house. Crossing to the other side continue in the same direction up High Lane passing Croft House. 2. At the side of The Barn turn right over a stile to walk down a grassed path to meet a barrier in front of a stream. Turn left to follow a track up through a hedged and treed area, to walk alongside the stream. At the field corner follow the path to the right uphill for a short distance to meet a path on the left at the edge of a wood. Follow the path as it runs alongside the field and then rises up through a scrub area to pass between fences, to a field edge with trees on the right hand side. Continue to follow this path until it comes out onto Alsa Street. 3. Turn right and after about 100 metres turn left onto a signposted path. Follow this path through the wooded area, passing a gate to a field edge. At the end of this field, turn sharp right to walk along a wide grassed track with a high hedge on the left hand side. Continue to follow this path until it comes out on a road. 4. Walk straight across the road to another path and follow this fenced path until reaching the edge of Alsa Wood. Turn right to walk with Alsa Farm on the right side, and the wood on the left. Alsa Wood is ancient woodland (pre AD1600), predominately Hornbeam coppice and a very good Bluebell wood, best in Late April and early May, which you will be able to see by looking into the wood. Cross a stile and pass the Christmas tree plantation to arrive at a roadway. 5. The entrance to the Essex Wildlife Trust Aubrey Buxton Nature reserve is almost opposite to the right. Here, you can either walk through the nature reserve using the map and notes at the foot of this guide, or continue to follow the walk route around its outside edge. 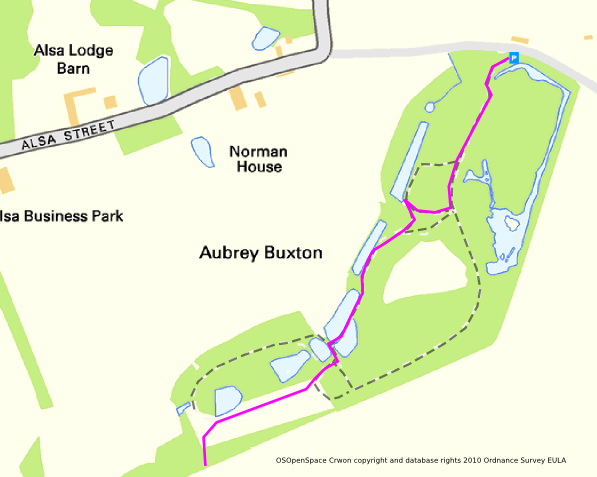 If taking the outside route, continue to follow the lane eastwards past the nature reserve entrance, turning right onto the path that follows the reserve edge. At the first corner continue to walk on the field edge and follow it downhill until a hedge between two fields is reached on the left. Turn left to walk on the left hand side of this hedge across the field to arrive at the corner and a fenced path. 6. Follow this path until a small spinney is reached, and then out into another field, walking directly across this to the far corner. Bear right to walk down a path by a fence and passing between gardens out onto a tarmacked roadway. Turn right and then sharp left to walk alongside the stream passing the Stansted Youth Club and the Dog and Duck pub to arrive back in Stansted Mountfitchet from where it is a short walk back to car park. Historically the reserve was the pleasure park for Norman House in Alsa Street, and so was very much a designed landscape. The many beech trees, planted in the 1880s, which are now suffering fungal attack weakening them and requiring their felling for safety, are not at all native to this part of the country. The three large ponds in a row may well date back to the Middle Ages. They seem man-made and may have been fish ponds. From the main entrance at the car park, follow the main path into the reserve and continue until you reach a group of mature Beech trees, including the massive trunk of one which had to be felled for safety reasons as it had begun to succumb to rot. Take the first path on your right down towards the first pond, and the small hut. This pond and the next pond downstream have recently been dredged, and cleared of most of the trees around them to let in light and reduce the input of falling leaves to the ponds. The Wildlife Trust hopes that this will greatly improve their wildlife value. Turn about and follow the path around passing the hut to its left side and then slightly up hill and then downhill towards the second pond. Continue on down the valley beside the third pond, taking great care as this path is gradually eroding into the pond. At the end of the third pond, turn left and immediately right across the long sloping meadow towards the south east corner. The open grassland areas are heavily grazed by rabbits but some areas have been fenced off and you may find st. john’s wort, adders tongue ferns, early purple orchids and common spotted orchids. At the end of the meadow walk uphill to the left through the trees leaving the reserve through the open gate and rejoin the path along the outside of the reserve. Turn right here and continue along the field edge to the hedge between two fields as in Instruction 5 above.